When it comes to makeup, drag has always reigned queen. Our most beloved beauty trends, from brows to contour, have roots in drag. So what else can we learn from these fabulous ladies? 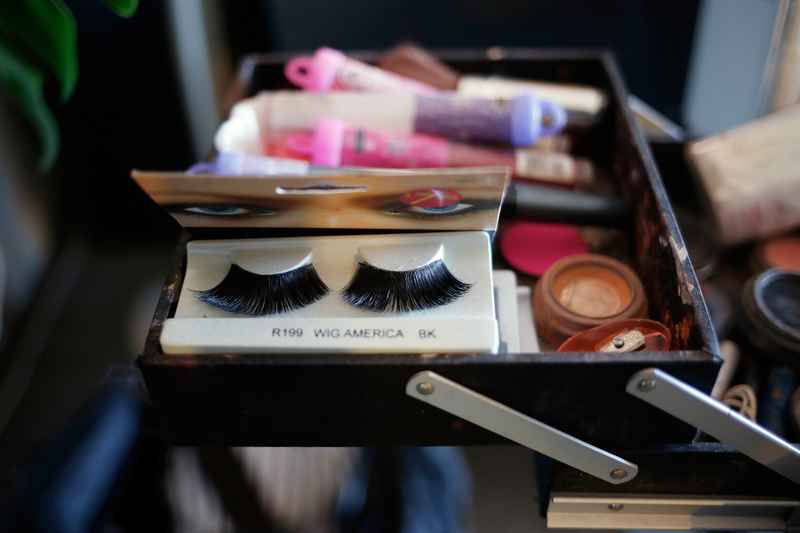 Here's the one beauty tip drag queens want you to know. Glue is the magic that holds a drag queen together. Adhesives of all kinds create show-stopping looks and helps keep everything its place, makeup included. Drag queens are known for their inventiveness and ingenuity when it comes to beauty. While the rest of us are vaguely familiar with primer and eyelash glue products, drag queens are way more resourceful and will use whatever it takes to create lasting looks. "I use eyelash glue, wig glue, I’ve got two different kinds of tape to hold my tuck back," said Courtney Act, according to PopSugar. "There are lots of adhesives in strange places. Never underestimate the importance of superglue or hot glue, or just any glue in general." Yep, that's right — glues of all kinds, and creative alternatives, are a queen's best friend. "I use my spit with any type of eye shadow, because I feel like it just sticks on better than water," said Adore Delano. Spit is definitely creative, but it doesn't stop there. If you're reading your labels (of all kinds) you'll find unique primers in unlikely places. "I found this great makeup primer, and I read the ingredients. I realized the main ingredient is also the same main ingredient that’s in my lube!" said Darienne Lake. "It’s the same exact stuff — dimethicone! Then I also found the same ingredient in my hair shine that’s really expensive. But I’m a bargain queen, so sometimes I’ll use just a drop of lube on my face as a primer or in my hair for silkiness. Lube as a primer makes makeup just glide over your face so smoothly." It's an unlikely primer that's easy on the budget and works like a charm. The main ingredient — glycerin — creates tackiness on the skin, helping your foundation stay on all night. You can put your primer on first, or mix it with your foundation for a more sheer coverage. This line has plenty of formulations for all kinds of problems, from uneven texture to fine lines. Glitter is a drag queen's staple. To make pigments stay on and off your foundation, use a high-powered eye primer. You can also wet your brushes with setting spray to make the glitter stick with a metallic finish. Whether you're applying individual lashes or stacking strips on top of each other, a waterproof lash glue is a must. April Carrion shared, "I glue my fake lashes directly onto my real lashes instead of along the lash line above to give me a more open eye. I sandwich the two together and tilt the fake lashes up really high, which makes me look like I have bigger eyes." Lip primer helps full in wrinkles and creates a smooth foundation so your lipstick can last all night long.